The Staffordshire bull terrier, also called the Stafford, Staffy, or Staffie, is a medium-sized dog of somewhat short stature with a muscular, athletic body. Contrary to its tough appearance, the Stafford is a gentle, loyal, and highly affectionate dog breed. Praised for its "nanny-like" instincts, the Stafford gets along remarkably well with children when properly trained and socialized. However, because of this breed's strong prey drive and dog fighting ancestry, use caution around other pets. Coat and Color: Short, smooth coat in red, fawn, white, black, blue or brindle (any shade). All colors may be with or without white. The Staffordshire bull terrier was developed in England during the 19th century for dog fighting. In order to create a faster and more compact dog breed, bulldogs were crossed with small terriers, most likely Manchester terriers and similar breeds. At the time, bulldogs were large, fierce, and intrepid, much different than today's bulldog. Before landing on its current name, Staffords have been called bull-and-terrier dogs, bulldog terriers, and old pit bull terriers. Once dog fighting was made illegal in the early 20th century, Staffords became more widely recognized and loyal and affectionate companion dogs. The Staffordshire bull terrier was brought to the U.S. towards the end of the 19th century but was not officially recognized by the American Kennel Club until 1974. The short, smooth coat of the Stafford requires little more than routine grooming. This breed tends to shed at a low to moderate rate, though shedding does increase seasonally. Be sure to keep the nails neatly trimmed for healthy, comfortable feet. As with any dog breed, proper training is a must for the Staffy. This is a very intelligent dog breed that can be stubborn, following his own will if permitted. Therefore, obedience training is essential in order to manage your dog and give him structure. Socialization is just as important, so your dog will be comfortable in all kinds of situations. The Stafford is an athletic dog breed with plenty of energy, so routine exercise is essential. Be careful not to overdo it in warmer weather, as the breed is typically sensitive to heat. Staffords will especially benefit from dog sports that challenge them mentally and physically. A securely fenced yard is a good play area, but be aware that the Stafford is a terrier and will dig an escape tunnel if able. You may wish to reinforce the bottom of fences. Staffordshire bull terriers should never be walked off-leash as they can be aggressive with unknown dogs and will chase any small animals they consider to be prey. They are unlikely to do well at free-run dog parks. They are strong dogs and you will need to train your dog not to pull on the leash. Overall, Staffordshire bull terriers have friendly, gentle dispositions and make lovely companions for many types of households. If raised together, well-trained, and closely supervised, they may even learn to get along beautifully, but some of these dogs will be best suited for a one-pet household. 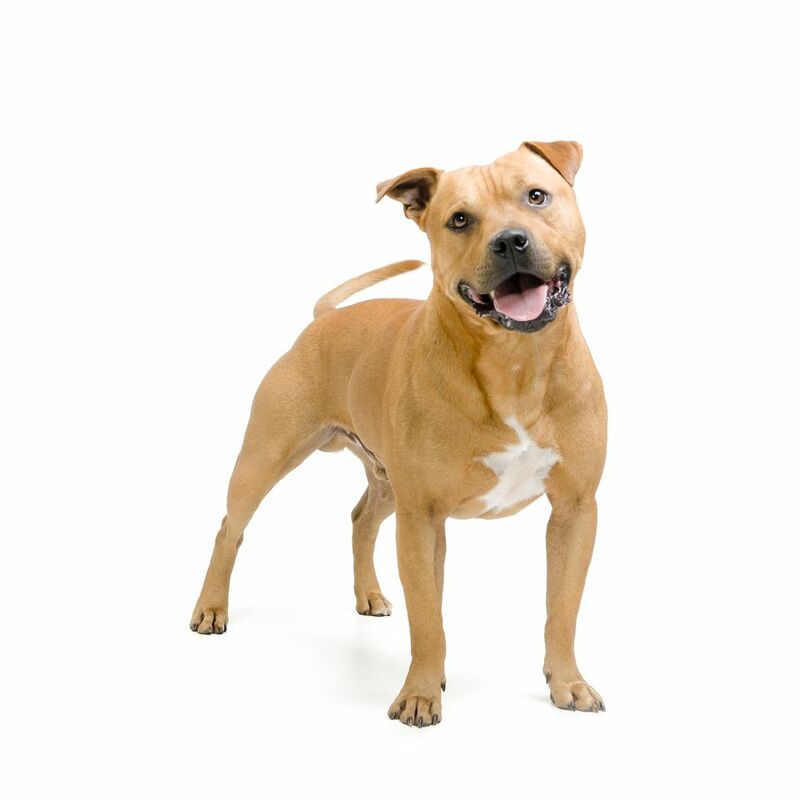 Your Staffordshire bull terrier should be fed two meals a day of dry dog food, each of up to 1 cup of food. Your dog's individual needs will be determined by age, activity level, and health conditions. It's best not to exercise your dog for an hour after eating in order to help reduce the risk of bloating and stomach torsion. Staffordshire bull terriers don't need much grooming and shed less than other breeds. Staffies are loyal, kind, and protective of children. This breed is very affectionate and playful. Staffordshire bull terriers need a lot of exercise but are also sensitive to heat. This breed may be aggressive toward other animals and may need to be in a one-pet household. Staffordshire bull terriers have a tendency to chew and dig, especially as puppies. Staffordshire bull terriers may be available at local shelters or with rescue groups. Check with breed-specific rescue groups to see if they have information on staffies in your area. If you are active, patient, and ready to provide plenty of one-on-one affection to your dog, the Staffy could be the dog breed for you. However, it's important to do more research before you decide to get one of your own. Talk to veterinarians and pet professionals, Staffy owners, responsible breeders, and bully breed rescue groups to learn all you can.